After knowing about the basics of Pranayama it is time to know some of the most commonly used forms of Pranayama and Yogic Breathing techniques. Ujjayi is often called the “sounding” breath or “ocean sounding” breathe. It involves constricting the back of the throat while breathing in and out air. This creates a sound effect coming from the region of the throat because of the friction caused by passing air. Acquire a comfortable position with your spine erect. This can be while sitting preferably on the ground in Sukhasana or Vajrasana. For those who cannot sit on the ground, they can set on a chair at the front edge keeping both the feet flat on the ground with back away from the backrest and spine straight. If even this is not possible one can lie down flat on the back. Keep the eyes closed and concentrate on your posture for about a minute. Then begin by taking long, slow, and deep breaths through the nostrils. Allow the breathing to be gentle and relaxed as you slightly contract the back of your throat creating a steady hissing sound as you breathe in and out. The sound need not be forced, but it should be loud enough so that if someone came close to you they would hear it. Breathe deeply and thereby lengthen the inhalation and the exhalation as much as possible without creating tension anywhere in your body. Try to get the sound of the breath to be continuous and smooth. Dirgha means “complete”. Hence this asana is known as the “complete” or “three-part” breath. It involves filling of the three chambers of the lungs, beginning with the lower lungs, and then moving up through the thoracic region or the middle portion of the lungs and into then the upper portion. After inhaling fully, stop briefly and start in exhaling. 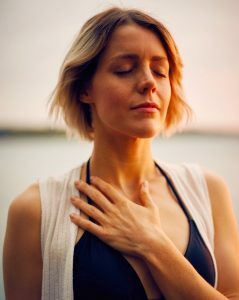 As you exhale, allow the belly to deflate like a balloon in the reverse order, that is – first vacate the topmost portion of the lungs, then the middle portion and thereafter the lower portion or the belly region, Repeat three to five times, keeping the breath smooth and relaxed, and never strain. 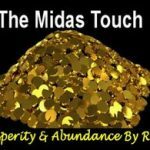 Nadi means channels and refers to the energy pathways through which prana flows and Shodhana means cleansing, so Nadi Shodhana means channel cleaning. Sit in a comfortable position as explained above. Hold your right hand up and curl your index and middle fingers toward your palm to make a sort of figure of “V” with the thumb and little finger. Place your thumb next to your right nostril and your ring finger and pinky by your left. Keeping your eyes closed to concentrate on breathing in and out of air. Close the left nostril by pressing it gently with your ring finger and pinky, and inhale through the right nostril. The breath should be slow, steady and full. Inhale through the left; Exhale through the right. Use of Pranayama and Yogic Breathing techniques: When to do it? You can use these prior to meditation and anytime you feel stressed. Whichever Pranayama and Yogic Breathing techniques you adopt, begin with 5-10 rounds and add more as you feel ready. Besides that, remember to keep your breathing slow, easy and full. Concentrate on your forehead and ensure that it does not become strained. If you feel out of breath, stop immediately, lie down for a few minutes. Take normal breaths and if you feel up to it, you can restart.